We decided to call him Gammy. He was a feisty old fox, with worn teeth and a stiff ankle where a once-broken bone had healed. It was the second-last day of my field trip and I’d been debating whether to pull the traps in as I drove up the road. We had already checked them at dawn and caught nothing, but here was Gammy at 11 o’clock in the morning – my fourth fox of the week. Although Gammy was old, he looked healthy enough and was the second-heaviest fox I’d caught. So we fitted him with a GPS collar, administered the anti-sedative and tucked him under a bush with a hot water bottle to recover. A couple of hours later, he was gone and the tracking beeps from his collar indicated he was moving through the shrubs nearby. Over the next five weeks I collected some of the oddest movement data I’d seen. Unlike the other foxes, Gammy didn’t move around a regular territory. Instead, he had three hotspots where he’d stay for days, travelling no more than a few hundred metres, before trekking a couple of kilometres to the next one. Also, most of the other foxes were active from just after sunset until dawn, and then lay up during the day. Gammy’s activity peaked from 10am to 3pm. Strange fox. It wasn’t until I went to collect his collar at the end of the study that it all made sense. After sneaking through a couple of electric fences and dodging rain-soaked cows, I found Gammy’s collar on the edge of the forest, near the area he had used most intensively. Just next to it was a huge pile of old cow hides, teeth and bone. 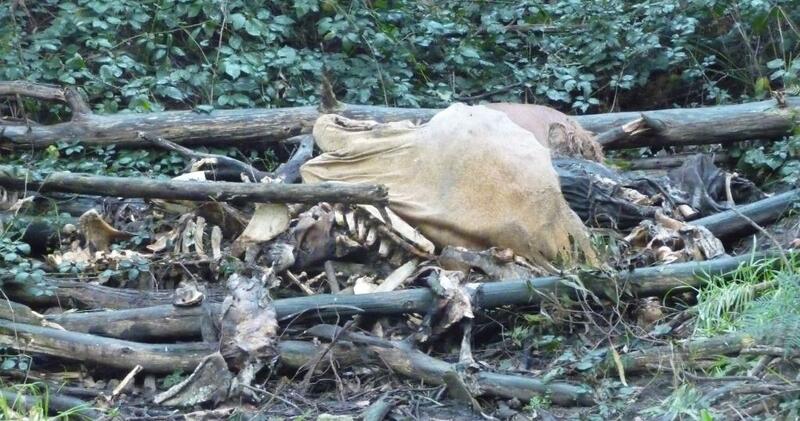 Mystery solved: it was a farmer’s carcass dump. Gammy may have been old but he had his territory thoroughly sussed. GPS-tracking collars are amazing. I could never have collected such high-resolution data on fox ranging behaviour and movement if I’d had to track them all on foot. Yet, sometimes hiking in the rain and falling in cow slush (thanks John! Field rule #1 – always let someone else go first when wading through sedge-bog) can explain so much. This experience with Gammy reminded me of a comment back at the start of my PhD. I had been sitting in the lounge room of our field house, replacing batteries in motion-sensing cameras, when one of the older naturalists on our team walked in. Tens of thousands of dollars’ worth of cameras were piled up around me, each one needing its screen cleaned and batteries replaced before I could put them out in the forest again. Sixty cameras x 12 batteries = a lot of fiddling around getting the positive terminals at the correct end. ‘Jeez,’ he said, squatting down to help. ‘In my day, we used to just go out to the bush and look for stuff’. He had a point. Remote-sense technology inevitably creates a barrier between you and the ecosystem you are trying to understand. When I use cameras to survey mammals, I tie each one to a tree in the middle of the forest and come back three weeks later to collect it and assess the vegetation structure. By the time I’ve done this 120 times, downloaded the photos and spent weeks identifying mammals, I’ve forgotten which site was which. 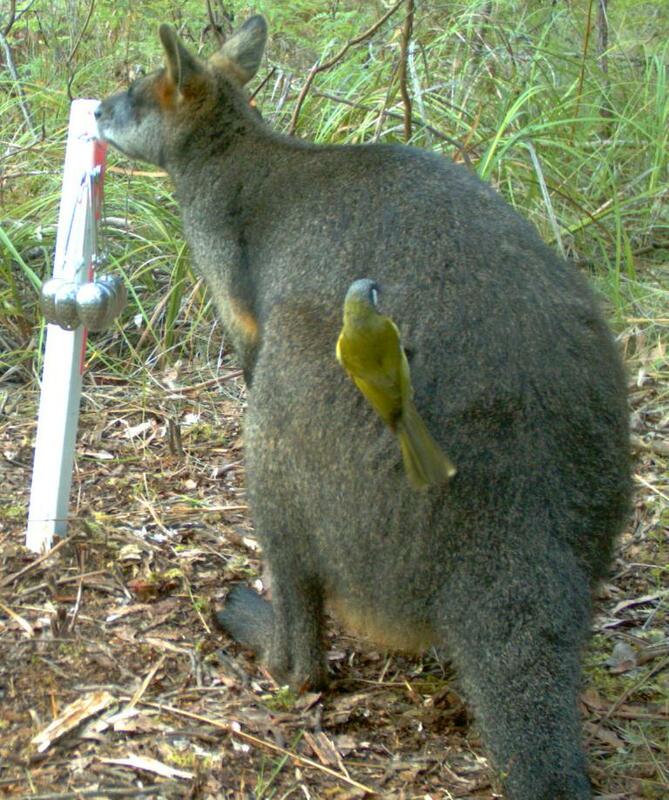 Motion-sensing cameras are a great way of surveying wildlife. The challenge is remembering where you put them! Because the sites are numbered, this isn’t really a problem – I can still test for statistical associations between, say, long-nosed potoroo occurrence and understorey vegetation cover. But I have no innate understanding of this relationship – it is so different to the feel for species’ habitat preferences you develop when you’re up at dawn every morning checking your traps. On the other hand, potoroos are apparently pretty tricky to trap. If I had been trying to catch (rather than just photograph) them, I would probably have spent most of my time looking at empty traps and cursing. 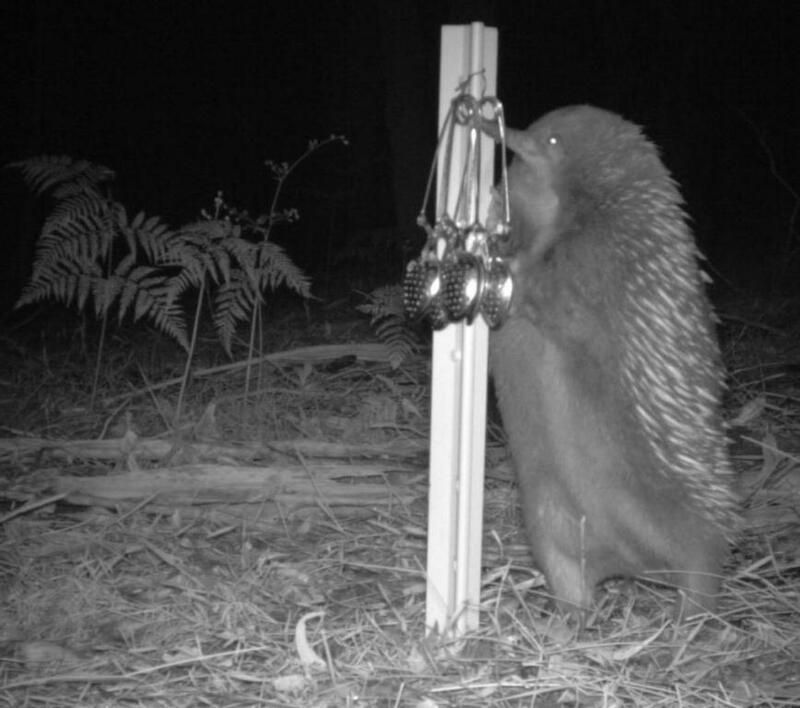 Instead, the cameras have given me mountains of data on the distribution and activity patterns of potoroos, as well as bandicoots, bush rats, possums, feral cats, foxes and umpteen other species. So, I dunno. Probably both approaches have their place. I think this is the best yet, love the photos and the video! I have been enjoying your blog – Ian Lunt from CSU recommended you (an old lecturer of mine). I work at Brewongle Environmental Education Centre on the Hawkesbury River near Sydney. We use wildlife cameras frequently with visiting school students and have discovered plenty of fauna around our centre that we would normally not see – so we love them! We only have 5 though – so not so much work for us. What are you using for baits? I normally use a peanut butter mixture or some meat – could you recommend the most effective baits? Keep the blogs coming and thanks! Thanks Steve – glad you’ve been enjoying it. Your camera program sounds great! I usually use a mix of peanut butter, oats, golden syrup and pistachio essence as a bait, held in tea infusers or a PVC vent cowl. I’ve found this works well for both native mammals and introduced predators. Some kind of fish oil (anchovy or tuna) can also be attractive to meat eaters. Which species have you been detecting? I’m planning to add another page to my blog with resources for camera-trapping in the next week or two, so I’d be interested in any feedback you might have. Hi Bron, if Michelangelo had spray paint or an angle grinder to chip marble I bet he would have used them. My guess is without camera traps you could spend a lifetime for a couple of glimpses and still be in the dark. Maybe you need a good dogs-body to do hack-work in field. Just ask. I need video footage to add to art project, see artlikker.wordpress.com be a great trade. What a great analogy – thanks Peter! 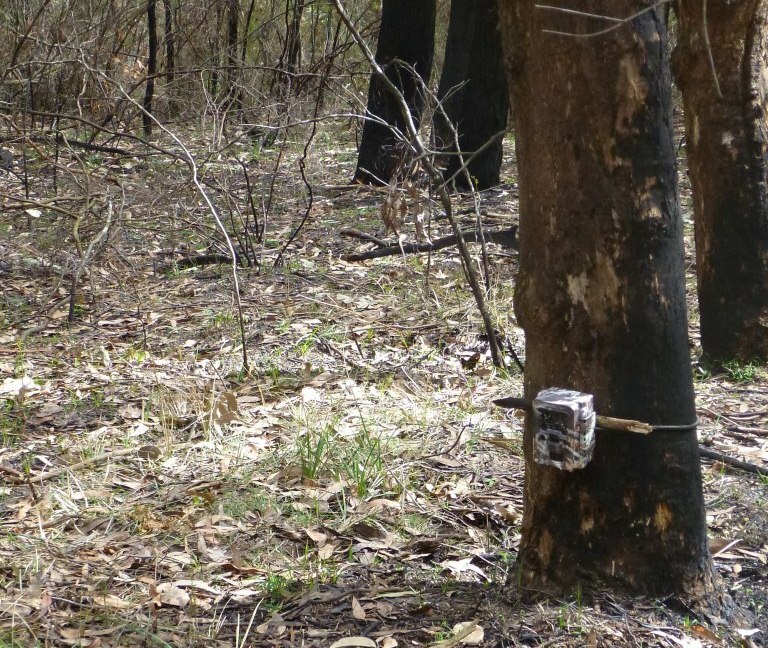 (though I’m not sure I can aspire to be a Michelangelo :P) Camera traps have certainly shown me a lot I could never have found out any other way. I’ve finished fieldwork for my PhD unfortunately but can pass your details on to other in our research group if you’re keen on volunteering. Thanks for sharing your blog also – stunning work! I particularly like the Departure Lounge. We have seen foxes quite frequently (some students saw one close up in the middle of the day last week!) and plenty of other fauna. Definitely interesting “disconnect” between getting the immediate data of interest more easily (through the tech) but losing the connection to the ecosystem that is gathered when you’re doing daily treks to and around each site. It is problematic as the separation of the data from the ecosystem is artificial. We can surely improve our understanding through applying more technology but again, some of this is limited in scope and we really do need to place value on experience and connection to the system itself – if we have anyone who has that, we should try to learn as much as we can. Overlaying and analysing high-res GIS data on top of animal movements can tell us a bit more, but there are also time-dependent reasons for actions (seasonal/chance) in addition to stuff like day-to-day weather fluctuations etc. I guess getting video and analysing that is a step along the way, and definitely an interesting POV too! 🙂 Keep up the good work!